Mind blowing views of Khumbu region including Mt Everest and Kanchenjunga. Explore the floral and faunal diversity in the Makalu Barun National Park. Observe the rural life of Sherpa and Rai peoples and explore their cultures and traditions. Explore the rare wildlife like Red Panda, Himalayan Thar, and Himalayan Peacock. The beautiful landscapes, waterfalls, Rivers and amazing big rocks. 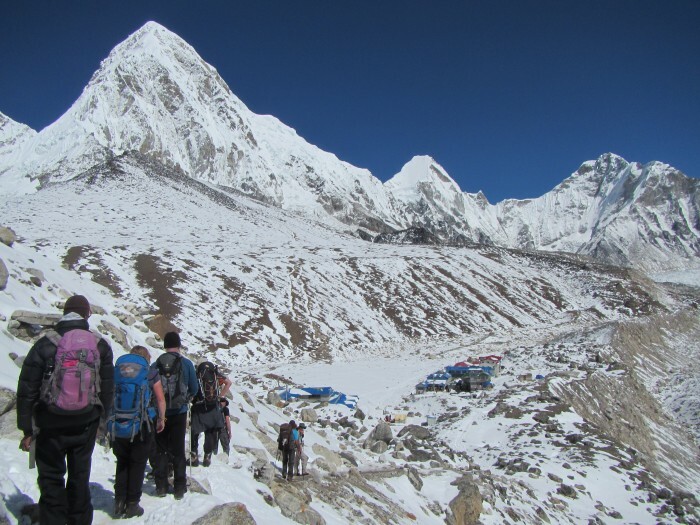 Makalu Base Camp Trekking is one of the most unfrequented and remote part trekking of Nepal. Makalu Trek is the real adventure. This trek is an ideal trek for those having enough time to explore the Himalayas and wants to experience the real adventurous journey to the great Himalayas that is full of natural beauties. The diverse cultures and vegetation makes the trekking lifetime memorable. Trek to Makalu is one of the most popular destination among the solitary trekkers which offers the exceptional opportunity to explore the high altitude terrains, snowcapped mountains and the Himalayan lifestyles. The traditional lifestyle which was left far behind by the modern peoples can be observed in this trek. Mount Makalu (8463m) is the fifth highest peak in the world. The Makalu Base Camp Trekking takes you very close to the Mt. Makalu. This trek takes to Makalu Base Camp which is now designated as Makalu Barun National Park which is the perfect habitat for different species of birds including the Wren Babbler which is rarely found in other part of the world. More than 75 species of mammals have adapted to this place since the Immemorial, including Red Panda, Snow Leopard, Musk Deer, and you may encounter them on the way if you are fortunate. These rare animals thrive in the cruel climate of the Mountains, and this is how they become legendaries. The lower region of Park is covered by the beautiful Rhododendron forests, while the upper region constitutes granite cliffs, hanging glaciers and waterfalls and both seems to push their limits to show you the beautiful aspects of Himalayan Landscapes. Makalu Base Camp, an ultimate place, offers you the incredible views of mountains such as Kanchenjunga massif, Everest, Lhotse, Baruntse, and others. The common places that the trail takes you are uphill and downhill and of course the valleys, alpine lakes, glaciers, rhododendron forests, alpine forests and Above all the trail takes you to the heart of Makalu Region. Flight from Kathmandu to Tumlingtar and back from Tumlingtar to Kathmandu. Welcome to Kathmandu. Our representative will be there for your warm welcome and transfer you to the hotel. You will be briefed shortly in the hotel about our tour and will be free to relax in the hotel. Overnight stay in Kathmandu. Day 02: Fly from Kathmandu to Tumglingtar and drive to Chichira [6497ft] – 50 minutes flight and 3-4 hours drive. After breakfast, we fly to Tumlingtar and meet our other crew members who are joining us in this trek. Then we drive to Chichira, a Gurung Village. We trek rest in Chichira and prepare for our trek. Overnight stay in Chichira. Day 03: Chichira to Num [5119ft] 6-7 hours. Today we head toward Num after having warm breakfast in Chichira. Walking through the beautiful village and lush mountain village will take us to Num. We will enjoy the beautiful nature on the way to Num. Overnight stay in Num. Day 04: Num to Seduwa [4922ft] 6-7 hours. We walk steep down through forests and terraced farms leads us to the Barun River. After crossing the river we follow an equally steep ascent up the other side. After short walk we enter the Makalu Barun National Park after registering the permits. Overnight stay in Seduwa. Day 05: Seduwa to Tashigaon [6890ft] 4-5 hours. We ascend through the ridge bounded by the Ipsuwa Khola and Kasuwa Khola to the east. Then we cross the silent villages and pass by the beautiful and small paddy fields and reach to the exotic village – Tashigaon. We will be surrounded by the breath stopping views of the Himalayan Panaroma in the Tashigaon. Overnight stay in Tashigaon. Day 06: Tashigaon to Khongma Danda [11,483ft] 6-7 hours. Today we will have comparatively tough walk as we have to follow a steep trail in higher elevation. We will ascend through forests and reach stream then onto a ridge. Now, the route becomes even steeper and we pass by the Kharka – Grazing land, and follow a series of rough stone stairs. Now its short walk to Khongma Danda. Overnight stay in Khongmo Danda. Today we will take rest. We can enjoy the beautiful nature and climate of Khongma Danda. There is an option to explore the surrounding of Khongma Danda . We will stay overnight in Khongma danda. Today, we walk for few hours towards the Shipton La pass. Then pass over the Keke La at 4,170 meters height. We can see the incredible view of Chamlang (7321m), Peak 6 (6,758m). After crossing the Keke La pass, we descend through the beautiful valley and reach Dobate. Overnight stay at Dobate. Day 09: Dobate to Yangri Kharka [11,670ft] 6-7 hours. From here, we pass through the beautiful Rhododendron forest which leads us to the Barun River and upper reaches of the valley. We should be very careful during the first two hour of the trek as the trail is very steep. Then, we will have a pleasant walk. After some walk we reach to our today’s destination The Yangri Kharka at the base of the valley. Overnight stay at YangriKharka. Day 10: Yangrikharka to Langmale Kharka [14,468 ft] 5-6 hours. We will have moderate walk today passing the yak pastures, lush forests and boulder fields. We pass Merek as we make our way further up and notice the significant rise in the Himalayan views. Overnight stay in Langmale Kharka. Today we will reach to the Makalu Base Camp. From Langmale Kharka we walk up to Shersong and eventually to Makalu Base Camp. The route is flat with icy glaciers and snow-clad mountains. As we approach Shersong, we will approach the beautiful view of Mount Manaslu. As we reach Makalu Base Camp we will find ourselves surrounded by the great Himalayan Peaks. Overnight stay at Makalu base camp. The Makalu Base Camp is a rocky barren place with the large Barun Glacier beyond it.From here we can see the extraordinary view of Makalu south and the complete Panoramic view of Everest and Lhotse. We can explore the surrounding lakes and glaciers and also have a short trek up. Overnight stay at Makalu Base Camp. Today we descend down from Makalu Base Camp and take our last glimpse of Makalu before heading back. We trace the same route back. On the way we pass through Shersong, Langmale Kharka, Merek and descend down the valley and stop at Yangri Kharka. Overnight stay in Yangri Kharka. Today we descend through the rock falls, green forests and valley enjoying the great views of nature. We follow the river bank of Barun and finally reach to Dobate for Overnight stay. Day 15: Dobate to Khongmadanda : 5-6 hours. Firstly we climb steeply from Dobate to Mumbuk and pass through a forests of firs and rhododendrons. We then cross different passes like Keke La, Tutu La, and Kauma La en route. Then we descend to Khongma Danda for overnight stay. We take a frequent long steeply descent walk cutting through the hillsides. We pass by thick forests and finally reach to the indigenous Sherpa village of Tashigaon. Overnight stay in Tashigaon. Day 17: Tashigaon to Seduwa : 4-5 hours. Today we exit from the Makalu Barun national Park and descend down to the Barun River. Then we cross the hillsides and come across the villages and settlements and move down finally stopping at Seduwa for the overnight stay. Day 18: Seduwa to Num: 5-6 hours. Today we leave Seduwa and walk up and down towards Num. We cross the dense forests and Sherpa settlements as we move downwards. Overnight stay at Num. We retrace our steps to Chirchira from where we can have the glorious view of mount Makalu for the last time. Then we pass by the different forests and streams and finally reach Tumlingtar for our overnight stay. We will be prepared for tomorrow’s flight. Early in the morning, we fly back to Kathmandu. After the long trek in the mountains, we can rest and relax throughout the day in our hotel or do some shopping before leaving Nepal. Overnight stay in Kathmandu. Today our long mountain trek ends. Our representative will drop you to the airport 3 hours before your scheduled flight and we wish for your safe journey and good bye with the hope to see you again.